A Coast Guard Dinghy in GTA Chinatown Wars. 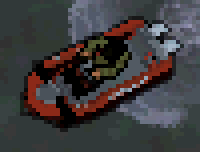 The Coast Guard Dinghy is a law enforcement Dinghy in Grand Theft Auto: Chinatown Wars. The boat is evidently a Dinghy-based patrol boat for the coast guard, with its orange-red color hull and minor outfitting that distinguish it from conventional Dinghy's. Performance wise, however, the Coast Guard Dinghy stakes up at about the same level as the Dinghy; neither does it possess any special abilities. Unlike the Coast Guard Launch, it is not actually used by the coast guard, except for in the mission "Missed the Boat?" At a dock in eastern Fishmarket South, Algonquin. This page was last modified on 8 February 2010, at 04:39.